With the publication of his new book, The Light of the World, Pope Benedict’s openness and willingness to engage the world in order to bring the light of Christ to others has once again ignited a controversy. His words about the hypothetical use of condoms by a male prostitute with AIDS for the sake of saving the life of another were quickly twisted to give the impression that the Church is now doing an about face in regard to its long-standing teaching that every use of artificial contraceptive is a moral evil. What in fact he was saying was obscured mainly due to the fact that all of the static erupted before the book was officially released. We ended up once again, as a result, in a propaganda tsunami and not with a dialogue because Benedict could not yet speak for himself if the vast multitude were not yet able to read the book for themselves. Benedict’s desire to dialogue and to engage the sincere questioning of a world caught up in unsatisfied desires for life and love, in frustrated attempts to seek and to know God, is frequently short-circuited by those who wish to twist the news and the words of the Pope and of others in order to advance their own malicious or alien agendas. Those of us in the Church owe it to ourselves and to Pope Benedict to simply read what he says, to allow him to speak for himself, and not to refer to what others say that he said. Many were caught up, regardless of good motives or not, in a fruitless effort to re-spin the media tidal wave in order to help alleviate the confusion for the good of fellow believers but who, in some cases, only added to the cacophonous din. Clarity and understanding were lacking where dialogue was not aided by a receptive and listening silence. Pope Benedict is not turning aside or throwing over the Church’s teaching that exalts the love of man and woman in marriage when it is expressed by the complete gift of self and rejects the falsification of the sign of marital love through artificial contraception which prevents sincere self-giving. Father Fessio has aided all of us to better understand Pope Benedict’s words. He uses the example of thugs using pipes to beat and rob others. A thug who decides to use a cushion to soften the blow is still doing something that no one can approve of: he is using a pipe to beat and rob innocent people. 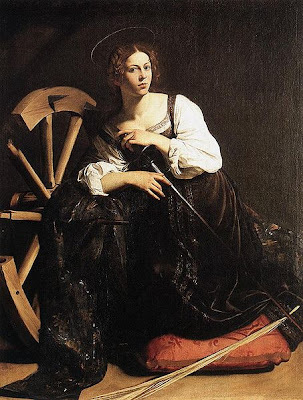 It is the same with Pope Benedict’s words about a prostitute who uses artificial contraception: there can be no approval either for the action itself or the means used. The example was offered by the Pope only as a sign of hope that a human person can move in the direction of full freedom which is only found in the complete renunciation of sin and acceptance of Jesus Christ, the Light of the World. With the lighting of our Advent wreath we, also, hope to grow more fully into the freedom offered by Jesus Christ to live our lives in responsibility which is the authentic expression of love for God and for others. This responsibility must be based upon a dialogue with the Lord. In order to have a true conversation we must have the capacity to listen so that the other and his or her insights and love can be included in our own richer response for having included them in our lives. We think of husband and wife in a particular way when we speak of dialogue, for their mutual self-giving must be fertile; that is they must include one another not only through the sharing of the marital act but also in the mutual inter-relationship of speaking and listening which makes for true dialogue and is thus a sincere expression of and an enriching of their marital love. The same is true for all of us in our relationship with the Lord. When we listen with care and attention to the Word and the homily, when we participate in the singing of the Psalm we are taking part in a dialogue initiated by the One who loves us above all others and who, in His love, speaks saving Words. His words do not begin and end here, but they are given as Spirit and life, so that in grace they might grow as a flame which burns with the light of Christ Himself, the warming and life-giving power of God which is our Faith. And we also listen in silence. In two places in our liturgy the gift of silence is used, not as an empty moment devoid of meaning unless it can be filled with something else. No, the silence too is a rich moment because filled with all the fullness of God Himself, proclaimed in His Word and received in His Eucharist. That is why these two periods of silence are placed after the homily and after the Communion of the Mass. Each of us is invited to enter the silence with our own prayer, our own needs to meet and know the Lord, to both listen to and respond to Him. 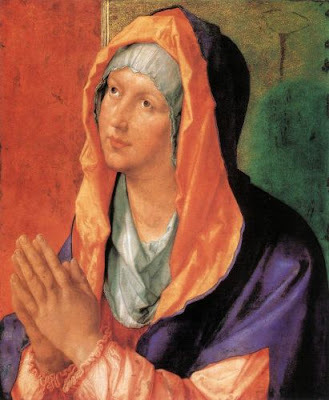 These periods of silent contemplation are then collected and expressed in the common prayer of the Creed and general intercessions and the collect, or post-communion prayer. We must also face the fact that certain attitudes deriving from the mentality of "this present world" can penetrate our lives if we are not vigilant. For example, some would have it that only that is true which can be verified by reason and science; yet prayer is a mystery that overflows both our conscious and unconscious lives. Others overly prize production and profit; thus prayer, being unproductive, is useless. Still others exalt sensuality and comfort as the criteria of the true, the good, and the beautiful; whereas prayer, the "love of beauty" (philokalia), is caught up in the glory of the living and true God. Finally, some see prayer as a flight from the world in reaction against activism; but in fact, Christian prayer is neither an escape from reality nor a divorce from life. 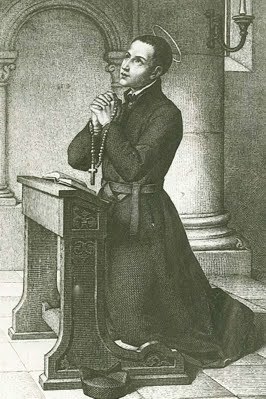 St. John Berchmans: "Blessed the men"
... whose strength you are! They go from strength to strength. Since Christ died for us out of love, when we celebrate the memorial of his death at the moment of sacrifice we ask that love may be granted to us by the coming of the Holy Spirit. We humbly pray that in the strength of this love by which Christ willed to die for us, we, by receiving the gift of the Holy Spirit, may be able to consider the world as crucified for us, and to be ourselves as crucified to the world. . . . Having received the gift of love, let us die to sin and live for God. Thanksgiving Day: "Let all your works give you thanks, O Lord"
... and let your faithful ones bless you. Let them discourse of the glory of your Kingdom and speak of your might. Thanksgiving characterizes the prayer of the Church which, in celebrating the Eucharist, reveals and becomes more fully what she is. Indeed, in the work of salvation, Christ sets creation free from sin and death to consecrate it anew and make it return to the Father, for his glory. The thanksgiving of the members of the Body participates in that of their Head. 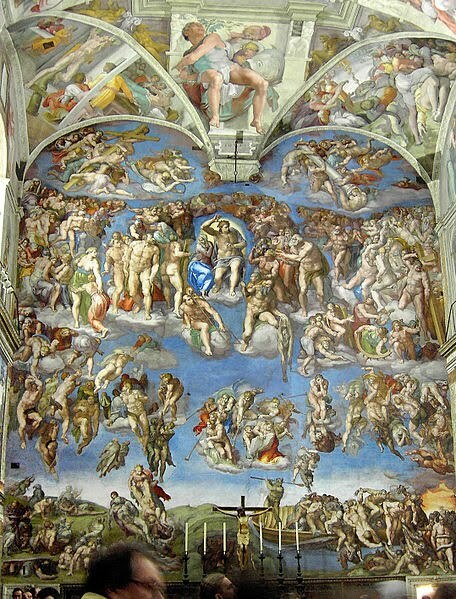 Sacred Scripture begins with the creation of man and woman in the image and likeness of God and concludes with a vision of "the wedding-feast of the Lamb." Scripture speaks throughout of marriage and its "mystery," its institution and the meaning God has given it, its origin and its end, its various realizations throughout the history of salvation, the difficulties arising from sin and its renewal "in the Lord" in the New Covenant of Christ and the Church. “The rulers sneered at Jesus and said, ‘He saved others, let him save himself if he is the chosen one, the Christ of God.’ Even the soldiers jeered at him … one of the criminals hanging there reviled Jesus”. In our liturgy of holy Mass for the Solemnity of Christ the King the sacred Scriptures take us back to the day on Calvary’s hill and into the presence of Our Lord who, dying on the Cross, accomplishes the perfect will of the Father for our salvation. We hear once again of those who stood, unbelieving, and watched Him breathe his last without a hint of sympathy and, much the opposite, sneered and ridiculed Him in most egregious acts of blasphemy which Our Lord forgave even with His last few words. What is royal or kingly about this One who dies the death of a criminal, abandoned by those He loved, ridiculed and derided by those who pass Him by? Jesus Christ is the perfect Suffering Servant because His Kingdom is of justice, love and peace. Today the sneerers and the revilers are still among us. These are the host of ridiculing unbelievers, some among the elite and ruling classes: kings and king-makers, politicians who claim the mantle "Catholic" or "Christian" but who spurn the moral teachings of Christ and do as they please in disposing of human life through crimes such as abortion or embryonic stem cell research and take part in the ridiculous and laughable pretense that holy matrimony can ever be anything other than a lifelong union between one man-husband and one woman-wife. There are also those who in pride stand aloof from the Lord and His Church because of the sinners in her midst, who ridicule Him dying once again in His martyrs such as we have recently witnessed in Baghdad, who are indifferent to Him as He suffers once again in the starving and choleric poor dying in Haiti, who blaspheme once again in the attacks on our holy Faith, who malign the Pope and believers without examining the facts. But there are also those, though physically within the body of the Church, who also sneer in a reenactment of the first Good Friday. The Lord who, dying destroyed our death and rising restored our life, speaks today in His Church. It is the Lord’s voice we hear through the power of the Holy Spirit in the praying and teaching Church. The revilers of today are those who attempt to intimidate the priest, for example, when he seeks to teach what the Church teaches so that the voice of Jesus Christ the King will be heard in our world today. These are the ones who attempt emotional blackmail, walking out of Mass in protest or leaving the community when the parish provides information on electoral candidates as directed to do so by the bishop, claiming falsely that the Church is “telling people how to vote”. Some stoop to personal attacks upon priests and others who seek to do what the Church does, whether in celebrating the liturgy or in teaching faith and morals. The sneering and reviling is manifested as intimidation in various forms when what is very easily verified as the authentic orthodox teaching of the Church is doubted, attacked, undermined or opposed in various ways. 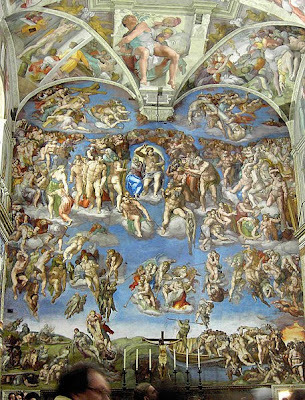 Some suffer from the malady of thinking that Vatican II gave Catholics the right to malign and reject every custom or tradition that was handed down prior to the Council as less than Catholic and, on the other hand, to naively adopt every practice advanced after the Council whether legitimate or not, whether authorized by the Church or not, or promoted as unauthorized innovations or abuses. Some simply refuse to change when faced with the evidence of their errors and, instead, adamantly and childishly insist that the Church change, or that the priest be silenced. Unbelievers today still mercilessly attack the Church, as if the Mystical Body of Christ the Suffering Servant is the source of the problems the world faces. Pope Benedict tirelessly and patiently reminds those who will listen, however, that it is neglect of God and the things of the Spirit that are the source of the problems that afflict the human person and the human family today. Man and woman seek purely material pleasure and comfort and neglect their spiritual well being to their own peril. Jesus is "the way, and the truth and the life". He is the ONLY way, truth and life. He cannot change who He is. And in the same way and for the same reason the teachings which really and truly bring Him and His saving life and grace to us today through the Church cannot change or be changed either. These matters of which we speak are the truth and morals which simply make it possible for men and women to live in the grace of His love which offer the life of the Kingdom of grace now and in eternity. It is to these truths that the Church must remain faithful. The Church does not make up who Jesus is. It is Jesus who made the Church so that through it He might be the light and life of man. 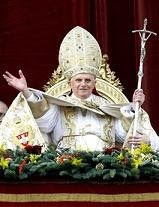 A do-it-yourself religion, Pope Benedict teaches us, will not sustain us in times of crisis. Our human weakness must be met with God’s power when our finite resources are strained to their limits. Christ is “the power of God and the wisdom of God”. He gives Himself ordinarily, and thus is available to all, through the Church in the sacraments. It is in this manner, then, that we must receive Him. We see new martyrs raised up around the world today who remind us that we, like they, must not be intimidated. We must confess the truth and speak of God and His will to everyone, this true Lord of love whose Kingdom shall come and who “desires that all be saved and come to the knowledge of the truth”. Praised be Jesus Christ, now and forever! 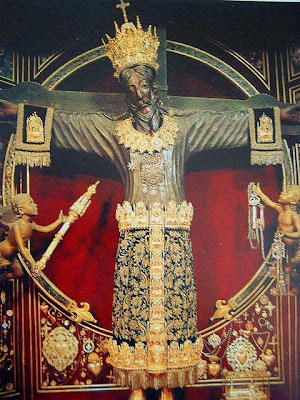 Photo: Volto Santo in the Cathedral at Lucca, Italy. Saturday, 33C: "I, John, heard a voice"
The Father's self-communication made through his Word in the Holy Spirit, remains present and active in the Church: "God, who spoke in the past, continues to converse with the Spouse of his beloved Son. And the Holy Spirit, through whom the living voice of the Gospel rings out in the Church - and through her in the world - leads believers to the full truth, and makes the Word of Christ dwell in them in all its richness." A church, "a house of prayer in which the Eucharist is celebrated and reserved, where the faithful assemble, and where is worshipped the presence of the Son of God our Savior, offered for us on the sacrificial altar for the help and consolation of the faithful - this house ought to be in good taste and a worthy place for prayer and sacred ceremonial." In this "house of God" the truth and the harmony of the signs that make it up should show Christ to be present and active in this place. 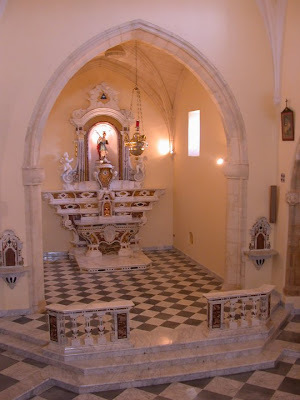 Photo: La Chiesa di Santa Giusta, Gesico, Sardegna / The church of Santa Giusta, Gesico, Sardinia. Thanks to Don Luca Pretta, pastor. Saint Elizabeth of Hungary: "to everyone who has, more will be given"
but from the one who has not, even what he has will be taken away. Since the initiative belongs to God in the order of grace, no one can merit the initial grace of forgiveness and justification, at the beginning of conversion. Moved by the Holy Spirit and by charity, we can then merit for ourselves and for others the graces needed for our sanctification, for the increase of grace and charity, and for the attainment of eternal life. Even temporal goods like health and friendship can be merited in accordance with God's wisdom. These graces and goods are the object of Christian prayer. Prayer attends to the grace we need for meritorious actions. Saints Margaret of Scotland and Gertrude: “‘The victor will thus be dressed in white"
... and I will never erase his name from the book of life but will acknowledge his name in the presence of my Father and of his angels.' "
The white garment symbolizes that the person baptized has "put on Christ," has risen with Christ. 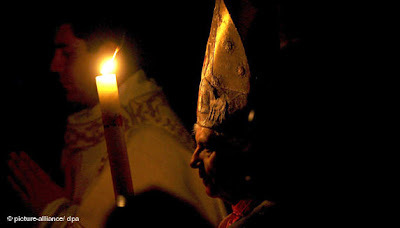 The candle, lit from the Easter candle, signifies that Christ has enlightened the neophyte. In him the baptized are "the light of the world." The newly baptized is now, in the only Son, a child of God entitled to say the prayer of the children of God: "Our Father." The name one receives is a name for eternity. In the kingdom, the mysterious and unique character of each person marked with God's name will shine forth in splendor. "To him who conquers . . . I will give a white stone, with a new name written on the stone which no one knows except him who receives it." "Then I looked, and Lo, on Mount Zion stood the Lamb, and with him a hundred and forty- four thousand who had his name and his Father's name written on their foreheads." 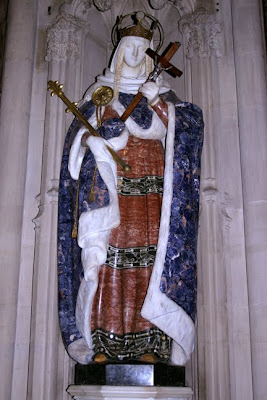 Image: St. Margaret of Scotland. 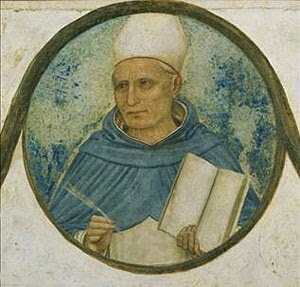 Saint Albert the Great: "he who is practiced in the law"
... will come to wisdom. Law is a rule of conduct enacted by competent authority for the sake of the common good. The moral law presupposes the rational order, established among creatures for their good and to serve their final end, by the power, wisdom, and goodness of the Creator. All law finds its first and ultimate truth in the eternal law. Law is declared and established by reason as a participation in the providence of the living God, Creator and Redeemer of all. "Such an ordinance of reason is what one calls law." Alone among all animate beings, man can boast of having been counted worthy to receive a law from God: as an animal endowed with reason, capable of understanding and discernment, he is to govern his conduct by using his freedom and reason, in obedience to the One who has entrusted everything to him. Sunday 33C: "you are not to prepare"
In one place the Scriptures tell us to prepare, but in today's Gospel it seems as though the Lord is instructing us to do the very opposite: do not prepare! But, in fact, what He means is that He Himself is our "preparation"; He Himself will be with us to defend and protect from evil and from eternal separation from Him in the place He describes as "Hades" or "Hell". To read the full text of homily for Sunday 33, Year C, at A Priest Life, please click here. Saint Frances Xavier Cabrini: "It is better to give alms"
... than to store up gold; for almsgiving saves one from death and expiates every sin. All religious, whether exempt or not, take their place among the collaborators of the diocesan bishop in his pastoral duty. From the outset of the work of evangelization, the missionary "planting" and expansion of the Church require the presence of the religious life in all its forms. "History witnesses to the outstanding service rendered by religious families in the propagation of the faith and in the formation of new Churches: from the ancient monastic institutions to the medieval orders, all the way to the more recent congregations." 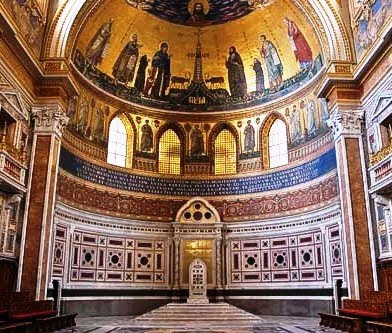 Dedication of the Lateran Basilica: "You are God’s building." Do you not know that you are the temple of God, and that the Spirit of God dwells in you? "Often, too, the Church is called the building of God. The Lord compared himself to the stone which the builders rejected, but which was made into the corner-stone. On this foundation the Church is built by the apostles and from it the Church receives solidity and unity. This edifice has many names to describe it: the house of God in which his family dwells; the household of God in the Spirit; the dwelling-place of God among men; and, especially, the holy temple. This temple, symbolized in places of worship built out of stone, is praised by the Fathers and, not without reason, is compared in the liturgy to the Holy City, the New Jerusalem. As living stones we here on earth are built into it. It is this holy city that is seen by John as it comes down out of heaven from God when the world is made anew, prepared like a bride adorned for her husband. Monday, 32C: "set right what remains to be done"
"How are they to believe in him of whom they have never heard? And how are they to hear without a preacher? And how can men preach unless they are sent?" No one - no individual and no community - can proclaim the Gospel to himself: "Faith comes from what is heard." No one can give himself the mandate and the mission to proclaim the Gospel. The one sent by the Lord does not speak and act on his own authority, but by virtue of Christ's authority; not as a member of the community, but speaking to it in the name of Christ. No one can bestow grace on himself; it must be given and offered. This fact presupposes ministers of grace, authorized and empowered by Christ. From him, bishops and priests receive the mission and faculty ("the sacred power") to act in persona Christi Capitis; deacons receive the strength to serve the people of God in the diaconia of liturgy, word and charity, in communion with the bishop and his presbyterate. The ministry in which Christ's emissaries do and give by God's grace what they cannot do and give by their own powers, is called a "sacrament" by the Church's tradition. Indeed, the ministry of the Church is conferred by a special sacrament. 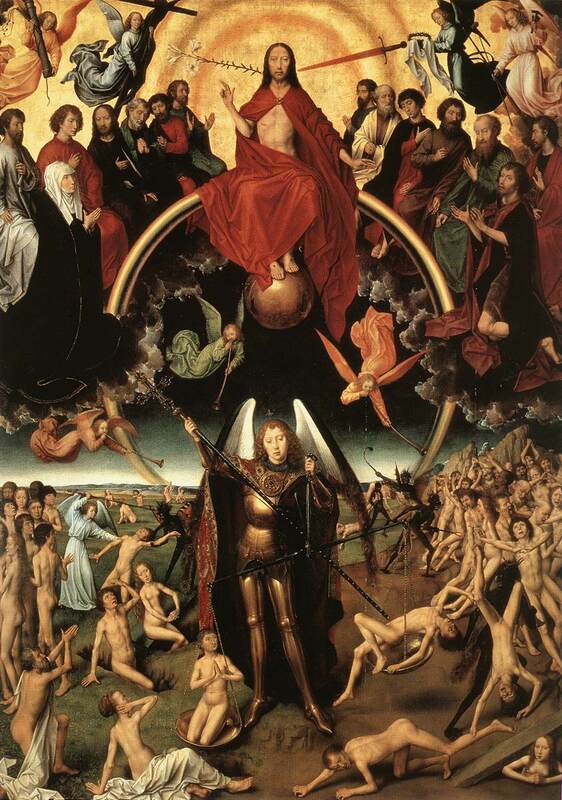 Sunday 32C: "The God of the living"
2 Maccabees 7:1-2,9-14; Psalm 17:1,5-6,8,15; 2 Thessalonians 2:16-3:5; St. Marriage is an earthly vocation. In heaven where God will be "all in all", man and woman will find complete fulfillment in divine Love. There each will behold God face to face. The life-long covenant for mutual and sincere gift of self in marriage is for husband and wife a prelude to and help toward the eternal happiness of heaven. In this world man and wife become one flesh in their life-long covenant, and may, if God so bless them, be fruitful in their openness to new life. Marriage is a total gift, and so it is "until death". Man and wife make for each other of themselves a total and sincere gift of self. Christ demands this total fidelity of spouses when he proscribes divorce. Meeting Christ in the Liturgy(See also Catechism of the Catholic Church paragraph numbers 1601 to 1666.) Publish with permission. Saint Leonard: "It is not that I am eager for the gift"
... rather, I am eager for the profit that accrues to your account. Grace is first and foremost the gift of the Spirit who justifies and sanctifies us. But grace also includes the gifts that the Spirit grants us to associate us with his work, to enable us to collaborate in the salvation of others and in the growth of the Body of Christ, the Church. There are sacramental graces, gifts proper to the different sacraments. There are furthermore special graces, also called charisms after the Greek term used by St. Paul and meaning "favor," "gratuitous gift," "benefit." Whatever their character - sometimes it is extraordinary, such as the gift of miracles or of tongues - charisms are oriented toward sanctifying grace and are intended for the common good of the Church. They are at the service of charity which builds up the Church. According to unreliable sources, Leonard was a Frank courtier who was converted by St. Remigius, refused the offer of a See from his godfather, King Clovis I, and became a monk at Micy. He lived as a hermit at Limoges and was rewarded by the king with all the land he could ride around on a donkey in a day for his prayers, which were believed to have brought the Queen through a difficult delivery safely. 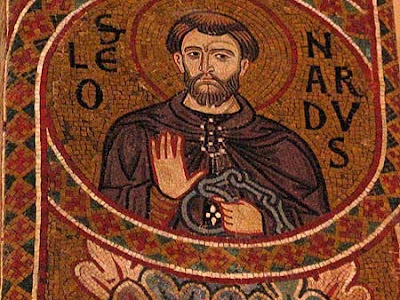 He founded Noblac monastery on the land so granted him, and it grew into the town of Saint-Leonard. He remained there evangelizing the surrounding area until his death. He is invoked by women in labor and by prisoners of war because of the legend that Clovis promised to release every captive Leonard visited. His feast day is November 6. Image is from the Capella Palatina in Palermo, Sicily. Click here to see more. 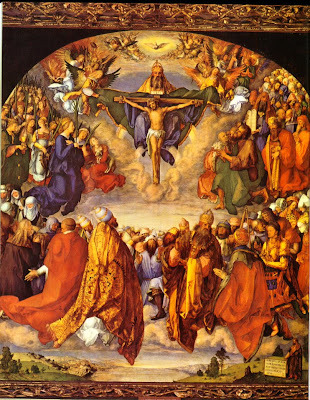 First Friday: "He will change our lowly body"
The unity of the Mystical Body: the Eucharist makes the Church. Those who receive the Eucharist are united more closely to Christ. Through it Christ unites them to all the faithful in one body - the Church. Communion renews, strengthens, and deepens this incorporation into the Church, already achieved by Baptism. In Baptism we have been called to form but one body. 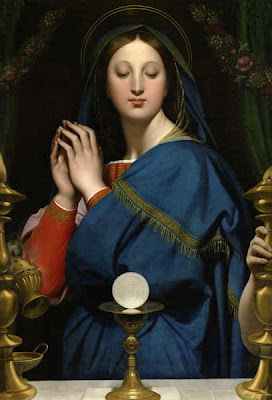 The Eucharist fulfills this call: "The cup of blessing which we bless, is it not a participation in the blood of Christ? The bread which we break, is it not a participation in the body of Christ? Because there is one bread, we who are many are one body, for we all partake of the one bread:"
If you are the body and members of Christ, then it is your sacrament that is placed on the table of the Lord; it is your sacrament that you receive. To that which you are you respond "Amen" ("yes, it is true!") and by responding to it you assent to it. For you hear the words, "the Body of Christ" and respond "Amen." Be then a member of the Body of Christ that your Amen may be true. The Commemoration of All the Faithful Departed, All Souls Day: "yet is their hope full of immortality"
"We believe that the souls of all who die in Christ's grace . . . are the People of God beyond death. On the day of resurrection, death will be definitively conquered, when these souls will be reunited with their bodies" (Paul VI, CPG § 28). All Saints Day: "I had a vision of a great multitude"
By virtue of our apostolic authority, we define the following: According to the general disposition of God, the souls of all the saints . . . and other faithful who died after receiving Christ's holy Baptism (provided they were not in need of purification when they died, . . . or, if they then did need or will need some purification, when they have been purified after death, . . .) already before they take up their bodies again and before the general judgment - and this since the Ascension of our Lord and Savior Jesus Christ into heaven - have been, are and will be in heaven, in the heavenly Kingdom and celestial paradise with Christ, joined to the company of the holy angels. Since the Passion and death of our Lord Jesus Christ, these souls have seen and do see the divine essence with an intuitive vision, and even face to face, without the mediation of any creature. Use the search bar on the upper left of this page to find reflections for the current Sunday. Type in the name of the Sunday or key terms. The world "Meets Christ in the Liturgy"
"I am a pilgrim on the earth"
It's the life of a parish priest. It's A Priest Life. "...liturgy is truly the apex of the Church's life, the time and place of a profound relationship with God." "The integration of elements of the Catechism of the Catholic Church with the readings from the Lectionary offers us an opportunity to demonstrate how the Word of God is able to animate our personal and communal life with Christ and, at the same time, articulate the Church’s faith that has been immeasurably enriched by the living tradition of twenty centuries."